The Hot stamp coder is the oldest and most prevalent method of applying a code to a label, originating in the pharmeceutical industry. Brass type are loaded into the typeholder, which heats up. A temperature controller regulates the heat. The Coder uses a ribbon which has ink and resin bonded together. When the label stops a signal is sent to the coder which activates a pneumatic solenoid to fire the typehead out. The brass type press against the ribbon and then against the label. The force of this leaves an impression in the paper and the ink from the ribbon in that impression. The code is immediately dry, so no smudges will occur, and no one can remove the code without defacing the label so this code is the most tamper-proof. The downside is that the holder gets hot, and so changing codes means either purchasing a second typeholder to load the new code in, or allowing the holder to cool before changing the code. For simple date codes the new code can be loaded in the morning and then the coder is turned on. A roll of ribbon can provide several thousand codes so the cost of a code is a fraction of a cent. Over the last few years, a new style of Ink Jet Coder has hit the market. Based on the popular HP technology, the ink is applied from a cartridge rather than an ink reservoir. The design allows for a very inexpensive code. The cartridges provide up to 100,000 prints if stored properly and there is little or no clean up after use. This is the least expensive unit we offer. 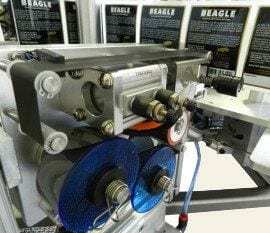 The disadvantages of the Ink jet are that smudges of the code can be common if the label material or construction do not allow adhesion or absorption of the ink into the label. In fact, film labels do not allow any absorption so the code can be rubbed off at any time. Lastly, an ink jet coder cannot apply a vertical code in the format of the labeler, only horizontal. This option provides the best code clarity and allows not only text or numbers, but also logos and barcodes to be applied to the label. It is the most expensive option we offer. 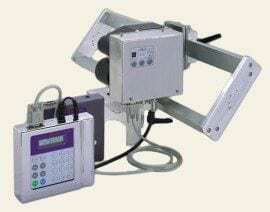 A thermal transfer Coder also uses ribbon and has a 2″ by 2″ area that can be utilized. Codes are actually developed on a PC and saved to a thumbdrive. The thumbrive is inserted into the coder and the user can then select from a list the code that is currently running. Dates and times can be programmed to pick up the new date automatically from an internal clock. Codes can be turned vertically or horizontally, and work on any label material. The unit is more expensive and so is the ribbon, but the flexibility and quality are much greater with this option.